Today we have a featured guest post from my good friend Dave Schneider. Dave has been working ridiculous hours day & night over the past several months in preparation for the launch of his exciting new tool. I won't spoil the surprise, I will let Dave tell you all about it. However, I for one think this tool is in a huge growth market as more and more people start to realize just how important ‘content' is for your business. Note: Dave no longer runs NinjaOutreach but can be found at his personal blog DaveSchneider.me). Hey, this is Dave formerly of NinjaOutreach. You may remember a previous article I wrote entitled, Why A Website Should Be Your Next Investment. This time Lewis has generously allowed me to introduce my prospecting and outreach software NinjaOutreach. The software is brand-new and in this article, I will be sharing exactly what it can do for you and your business. Also, be sure to pay attention until the very end because we are going to tell you how you can win a free license! NinjaOutreach is a blogger outreach software for digital marketers and small businesses interested in growing their presence online. Businesses need customers, and they can do that through lead generation or general outbound marketing. Our software helps them do both, by allowing them to search directly for business leads, or for bloggers, with whom they can partner to promote their product or service. Previously, this would have required several different tools to find the leads, extract the data, and outreach to them. We do this all in one, and do it much faster. NinjaOutreach collects an immense amount of data from a variety of sources into a searchable database, and allows people to email customized templates from within the platform. The current version is a desktop application for Windows. We hope to move to a web-based version in a few months. Ninja Outreach has dozens of features, today I will walk you through some of the most powerful ones. If you're looking to see which websites and bloggers are ranking high in your niche, you can simply enter a keyword and hit search, let ninja outreach do the rest. This is great if you are doing any sort of competitive research, or looking to work with bloggers for promotion. Ninja Outreach collects contact info such as email, contact URL, phone number, and social shares across multiple social platforms. Normally finding this information manually would take a long time. 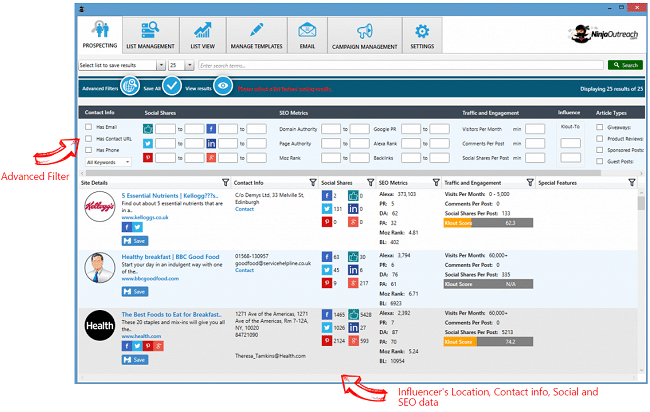 Ninja Outreach can find an email address or contact url for around 70% of the results. Don't you hate reaching out to someone only to find out that they don't write the type of article you're looking for? Ninja Outreach scrapes each website to see if the influencer does giveaways, guest posts, sponsored posts or product reviews. If it finds anything it will link to it so that you can view it and determine if it is good quality and a good fit for your promotion. You can create lists filled with hundreds and thousands of influencers, which will be stored in your account, so that you can access them any time. The advanced filter and sort allow you to find the influencers that fit your criteria for social shares, contact info availability, and SEO metrics. For example, if I only want to see the blogs that have a domain authority between 30 and 50 for my link building campaign, I can do so very quickly. NinjaOutreach integrates with all sort of email clients such as Gmail, Outlook, and many more. This allows you to send email from within the software through your client, without having to switch tabs! Anyone that has done significant outreach understands that personalization is clutch, however, at scale, this can be difficult and requires a lot of research. NinjaOutreach alleviates this burden by integrating custom fields into your outreach templates and then filling them in with the data it has available. Contact forms are a real pain and often they just get cast aside, however, Ninja Outreach will automatically fill in contact forms with your chosen template, using details such as email, name and subject to help speed up the process. I hate it when tools don't allow you to import or export your data. This makes it extremely difficult to transition into using the tool as well as get data out it. Ninja Outreach allows you to export your lists into an easy to use CSV for personal use on any tools or platform your desire! How Can I Use NinjaOutreach To Grow My Business? If you have a blog or a business and you are interested in working with other bloggers to help promote it, you can use ninja outreach to search for influences in your given niche and then outreach to them. This is particularly useful if you're looking for blogs that allow guest posts, product reviews, giveaways, and sponsored posts. In fact we are using Ninja Outreach ourselves to find bloggers to work with. If you are doing any sort of B2B sales you can use Ninja Outreach to generate leads and harvest contact information, which you can then use reach out to those leads via email. Again all this is done within the dashboard so you don't have to have multiple tabs or tools open.